In the process of skin aging, in addition to the decrease in the flexibility of reduced amounts of collagen and elastin, is a further reduction in the amount and redistribution of subcutaneous fat and weakness of face muscles. This process results in the appearance of wrinkles or noticeable changes in facial contours. One of the strategies to counteract it is to supplement the resources of collagen in the skin and to eliminate the effects of its loss. Linerase is a modern, biocompatible, biodegradable, non-immunogenic formulation with a high safety profile and proven efficacy trials. It is the only available on the market type I atellocollagen and it is designed for aesthetic medicine treatments. This treatment may become a breakthrough in the process of fighting against the signs of aging. As a result, the condition of the skin is improved by increased firmness, hydration and skin tone. The preparation does not cause side effects, allergic reactions and does not require allergy testing. Its use in combination with lidocaine, which makes the procedure painless. accelerating the healing process and regeneration of the skin. Total treatment consists of 2 to 4 procedures, depending on indications and the patient's skin condition. First results are visible after 7-14 days. After this period of time, you can see the difference in elasticity and density of the skin, you can enjoy the effects of a younger appearance. 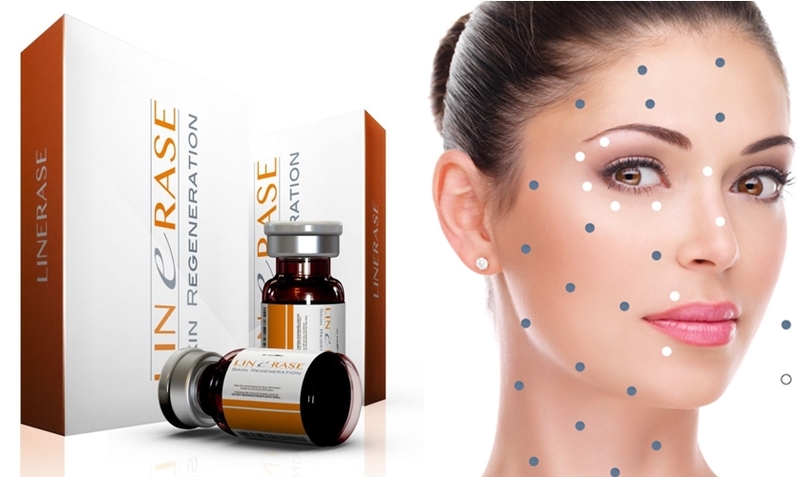 Linerase collagen mesotherapy is a natural regeneration and restoration of your own skin texture by reconstructing collagen fibers and formation of new collagen.